According to family legend, my great uncle Willie went to Paris with the UK Olympic team in 1924 then continued to wear the blazer proudly until well into the 1950s. 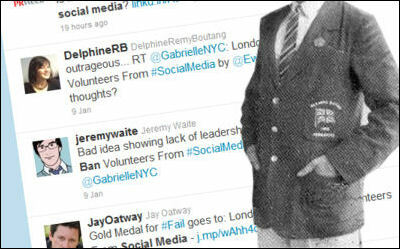 News that the London 2012 organizing committee intends to ban social media use by volunteers (BBC article) shows that they are perhaps out of touch with what motivates people today -- I doubt that anyone is doing it for the blazer -- and also highlights the extremely polarized attitudes to social media. Reactions to the ban on Twitter, Facebook and Google+ are almost entirely negative and reveal that many social media users are really baffled by the decision. This is hardly surprising since social media users are by definition generally favorable to social media use and strongly critical of any restrictions. On the other side there are some equally puzzled users who find the rules reasonable. Perhaps a more balanced view is that both sides are right in a way, but Locog -- the clunky abbreviation of London Organizing Committee of the Olympic Games -- is still at fault for not finding a better solution. This case is very instructive and will long be studied in communication courses. First of all, why all the restrictions in the first place? Cynics speculate that this is to protect vested interests in media -- newspapers and TV networks that have paid large sums for exclusive access dislike seeing rival videos on YouTube. I doubt that this is the real reason. More likely it is just the old-fashioned idea that you have to control the conversation or it doesn't take place. This used to be mainstream practice in corporate communications where every contact with outsiders had to be approved upfront. Technology has made this approach largely irrelevant and today PR people learn to mobilize other people to engage with audiences without this level of censorship, but the attitude still persists. 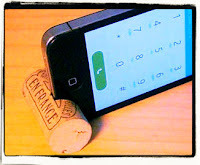 Actually there are some cases where restrictions on sharing text, audio and photos would be quite reasonable. One obvious one is when it would interfere with your work. Even though I am a great fan of social media I would think it distracting if one of the medal bearers were to pull out an iPhone and try to video the ceremony with one hand and hold the medal with the other. In the same way I imagine that you would be miffed if you were waiting in line at a supermarket checkout and the employee kept stopping to take pictures. It could also be downright dangerous if someone were to walk around the arena with their eyes on their phone while people around them are throwing heavy balls and sharp pointy things, just like you would not want to see your taxi driver tweeting. There can also be obvious privacy issues backstage where the athletes prepare, just like you might be annoyed if you are in hospital and staff were trying to get pictures of you to share with their friends. I am less convinced of the security excuse, but it is conceivable that in some cases this might be valid. While I can see that there are some cases where restrictions could be reasonable this does not mean that the ban makes sense. First of all because it is unenforceable. It is difficult to see how you can physically stop people using social media short of confiscating everybody's phones and as unpaid volunteers they are not going to be deterred by any threats of dismissal. More importantly the ban reveals a failure to understand the role social media play in people's lives today. What will motivate volunteers in 2012 is not the free blazer but the thrill of being able to share in this moment of glory with their friends. A blanket ban is more or less the equivalent of arguing that since burglars use flashlights they should be banned. A more measured response that both limits and encourages would motivate the volunteers, spare the organizers the embarrassment of a PR fail and turn this liability into an asset. Locog is not only shooting its own feet off, it is also missing a unique opportunity to exploit the enthusiasm of the 70,000 volunteers to connect with the public. As long as people are allowed only to retweet official tweets they will do nothing of the sort. Replace the ban with a mixture of sensible restrictions and encouragement and they can mobilize this resource to work for the benefit of the games, bringing them closer to the community.